We remember her as a cool rock lion of the 80s. Now kim Wilde, 57, is back. Because the kids are big - and they have more power than ever! 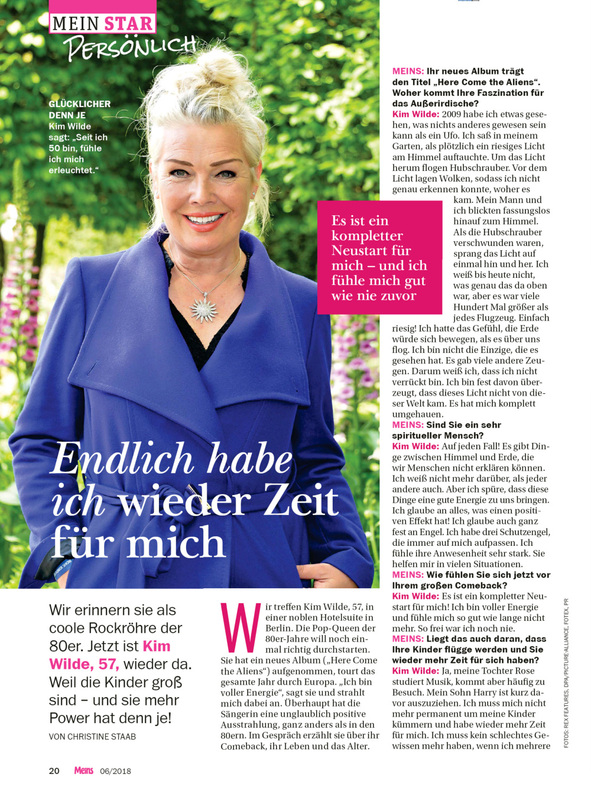 We meet Kim Wilde, 57, in a posh hotel suite in Berlin. The pop queen of the 80s wants to get started again. She has recorded a new album ("Here Come the Aliens"), touring throughout Europe throughout the year. "I'm full of energy," she says, beaming at me. In general, the singer has an incredibly positive charisma, unlike in the Eighties. In conversation she talks about her comeback, her life and her age. Your new album is titled "here come the aliens". Where does her fascination for the extraterrestrial come from? In 2009, I saw something that could not have been anything but a UFO. I sat in my garden when suddenly a huge light appeared in the sky. Helicopters were flying around the lights. There were clouds in front of the light, so I could not see exactly where it came from. My husband and I stared up into the sky, stunned. When the helicopters disappeared, the light suddenly jumped back and forth. I still do not know what that was up there, but it was many hundreds of times bigger than any airplane. Simply huge! I felt like the earth was moving when it flew over us. I'm not the only one who saw it. There were many other witnesses. That's why I know that I'm not crazy. I am firmly convinced that this light did not come from this world. It completely blew me away. Are you a very spiritual person? Definitely! There are things between heaven and earth that we humans can not explain. I do not know more about it than anyone else. But I feel that these things bring good energy to us. I believe in everything that has a positive effect! I also believe in angels. I have three guardian angels who always take care of me. I feel her presence very strong. They help me in many situations. How do you feel before your big comeback? It's a complete reboot for me! I am full of energy and I do not feel like a long time ago. I've never been so free. Is that because your children are fledging and you have more time for yourself? Yes, my daughter Rose studies music but often comes to visit. My son Harry is about to move out. I no longer have to take care of my children and have more time for myself again. I do not have to have a guilty conscience when I am traveling for several days at a time. I am always there for my children. But I enjoy my regained freedom as a mother very much. I experience it as a thoroughly positive experience. I receive the age with open arms! I learn more every day and grow. Of course, there are not so great experiences as you get older. People around you are getting sick, dying... I would not have been able to handle some of the experiences that I had to do today in my old age. They would have destroyed me emotionally. Today I feel wiser and stronger. I can stand the drama better. Family life is often a single drama. That's why I'm glad that I've only become a mother at a relatively late age (at age 37, editor's note). At a younger age, I would not have known how to do it all. Nothing can scare me in my mid-50s! I cope with every crisis and every problem. I'm ready for anything! Did you have real crises in life? Everybody has crises! But I also know the feeling of deep despair and not knowing anymore. But I survived every crisis. Are your 50s your best decade yet? Yes, it really feels that way to me. I love getting older. I feel almost enlightened. I'm not afraid to leave this planet someday. I enjoy every moment. As a young woman I always looked to the left and to the right because I thought I could find something better there. That was like that for many years. I never really enjoyed what was happening in my life. I always thought I could miss something. Since I stopped, I feel much better. You have to live in the moment - that's the key to happiness. The 50 was a turning point, from which everything was better? Yes. It was like a second spring! I started to feel really confident. For example, in the 1980s I never had so much fun at concerts as I do today. I barely performed in the 90's because I was too exhausted for it. Is it true that you had your first tattoo stung for your 50th birthday? Yes, on my right shoulder. I got it stabbed in Berlin. It's a design based on a necklace given to me. In the middle is a heart that says in Latin, "Love conquers everything," around it are stars and planets.